When you hire a professional carpet cleaner, you expect not only a clean result but also a fresh-smelling one. Carpets, rugs and upholstery readily absorb odors into their fibers, and removing them takes knowledge and experience of how to best work with each type of surface. McLaughlin’s Carpet Care in Longmont offers odor removal service that will not only deodorize but also completely clean any foul-smelling carpet or furniture. Pets– It is very difficult to totally remove odor caused from pet urine with conventional cleaning products. More often than not, these products use fragrances that only mask the smell temporarily. To effectively get rid of pet odor, it is necessary use professional-strength cleaning products, and sometimes also treat the pad and sub-floor if urine seeped down through the carpet. Finding every source of pet odor and assessing what treatment is necessary for each area is the key to our successful pet stain removal service. Smoke– Whether it’s from cigarettes or a fire, smoke permeates the carpet, rugs and upholstery in a home or business. When assessing the damage caused by a fire, don’t assume that your carpets and upholstered furniture are ruined. 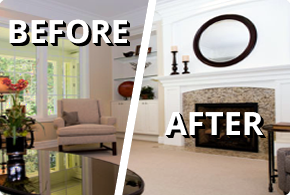 We have the knowledge and experience to salvage many stained and smokey surfaces! However, the more time that passes, the harder it will be to remove soot because of its acidic nature, and the smell of smoke will linger until the source is removed. Mildew– If your interior has been flooded due to broken plumbing, a storm or another source of water damage, the best way to prevent the growth of mold is professional carpet cleaning. Mold spores are unhealthy to breathe; they aggravate allergies and can lead to asthma. To restore your air quality and get rid of musty smells, trust McLaughlin’s Carpet Care to eradicate mold growth by thoroughly cleaning and drying your flooring and furniture. Should your carpets become warped due to water damage, we can also repair any puckering. Nobody enjoys spending time in a stinky environment, whether they are customers at your business or guests in your home. If none of the products or services you’ve tried have worked to get rid of a persistent smell, do not give up hope yet! McLaughlin’s Carpet Care in Longmont uses Eco-friendly products and proven techniques in our odor removal service that will leave your interiors smelling as fresh as new! We offer odor removal and deodorizing services to Longmont, Frederick, Firestone, Boulder, Lafayette and the Louisville, CO area. Contact us today for a free estimate!